Originally published in 1979. For decades conservationists have argued that increasing population will eventually out-strip the limited natural resources of the earth. Economists have responded by saying that any resource scarcity will be forestalled by changes in tastes and technology, induced by the appropriate price signals. This study is an attempt to develop a theoretical framework for analysing some of the issues related to this debate. Using an optimal growth theory framework, the author analyses the problem of optimally allocating a finite stock of the resource over time. In the process the author points out the crucial parameters and value judgments relevant to the various issues. 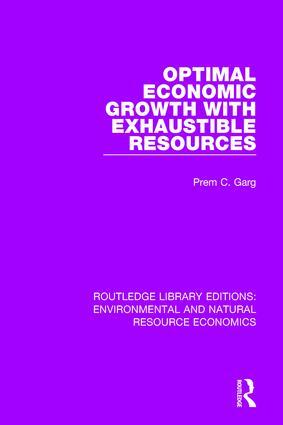 This title will be of interest to students of environmental economics.